On Sunday evening I was getting a wonderful view of the lunar terminator near the western limb just a half day before full Moon. The favorable longitudinal libration of -04° 40’ was creating an opportunity to see craters along the terminator that are often poorly placed for viewing. With storms on the way from the southwest this was a good evening to attempt a sketch. The calm before the arrival of storms often leaves the seeing fair to good as was the case on this night. 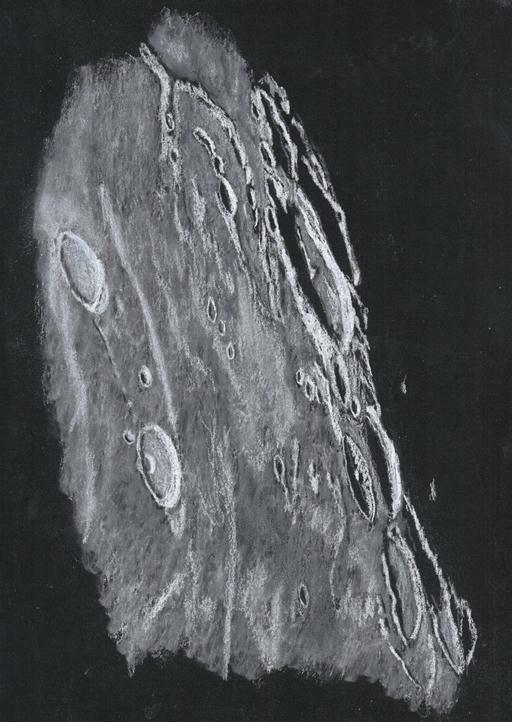 Craters such as Vasco da Gama (99 km. ), Bohr (73 km. ), Dalton (63 km. ), Balboa (71 km.) and part of Einstein (175 km.) were all seen. Craters Cardanus (51 km.) 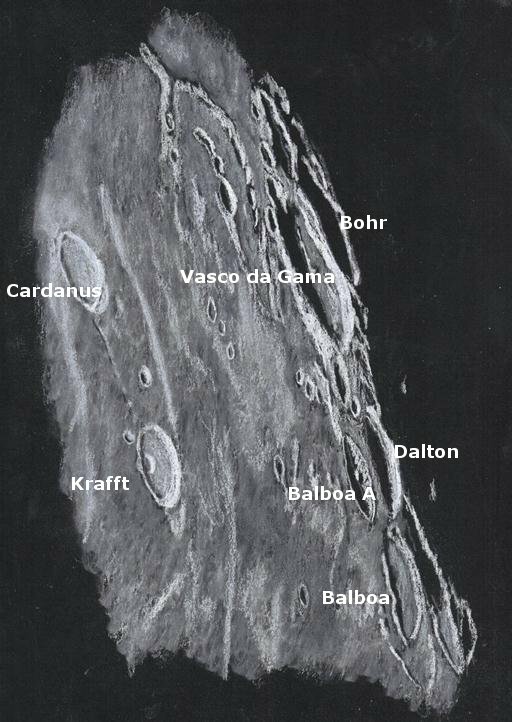 and Krafft (53 km.) and the crater chain (catena) between them were in bright sunlight. The views all along the terminator were magnificent. pastel pencils. In addition a small artist’s brush and powdered Conte’ white crayon was used for blending. Contrast was slightly increased (+2) using a scanner to better match the original. Just fantastic. Great catch and great artist. WOW!!! exquisite work as always. Frank, you never cease to amaze me!!!!! You are one incredible artist. Thank you all for your kind comment on this sketch of the western Moonscape. I like the way you rendered the ground surface and its gradients. Thank you much for that comment.